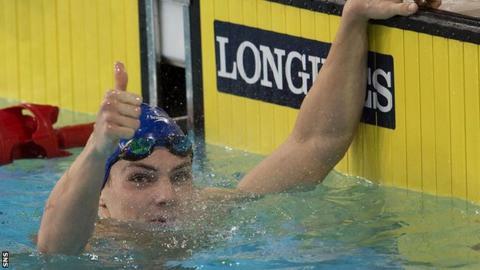 Scotland's hopes of victory in the 200m breaststroke final at Britain's Olympic trials in Glasgow were dashed by England's Andrew Willis. Craig Benson finished second and fellow Scot Ross Murdoch, the Commonwealth Games gold medallist, was third. Compatriot Michael Jamieson, the 2012 Olympic and Commonwealth silver medallist, was fifth. It means that Willis will qualify automatically for Rio, being the only one to reach the qualifying time. The 25-year-old set a new personal best of 2:08.08, almost a second faster than Benson. Benson, who sprung a surprise by beating Stirling University team-mate Murdoch, was just over half a second outside the Olympic time, but he hopes his achievement will book his spot in the team. "It's such a strong field, there's world-record holders, Commonwealth champions, three-time world finalists," said the 21-year-old. "It's crazy the competition and to finish in the top two was a huge challenge. To do it is absolutely amazing. "I knew if I raced my best time, I could put myself in the top two and a position to qualify. It just feels like an absolute dream, I can't believe it. "Hopefully they will select me, fingers-crossed till next Thursday. "It's out my hands now, but I've given it absolutely everything. It's going to be a sleepless six days." Adam Peaty, world record holder over 50m and 100m, led the field early on and was two seconds inside British record pace at the halfway stage. However, once the sprint specialist began to tire, fastest qualifier Willis took over to dominate the rest of the race. Murdoch was the second quickest going into the final after winning his heat but was edged out by Benson. Earlier this week, Murdoch finished second behind Peaty in the 100m breaststroke and is almost certain to join the world champion in that event at Rio this summer. However, he was "absolutely devastated" to miss out on the top two.